The Bangladesh national selection panel has reportedly held discussions regarding the form and consistency of Liton Das, Soumya Sarkar and Sabbir Rahman. 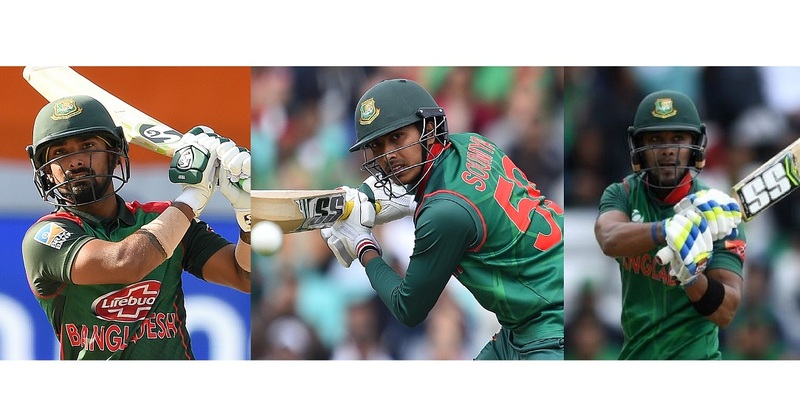 According to sources close to the BCB selection panel, all three of them are expected to make it to the final World Cup squad, thanks to a lot of backing from captain Mashrafe Mortaza. National chief selector Minhajul Abedin admitted to Cricbuzz that they are concerned as the trio is unable to live up to its potential both at the international level as well as in the domestic circuit. "To be honest, we are concerned considering their performance in the ongoing Dhaka Premier League, not because we would judge them through their performance in the tournament, but they are somehow not performing to our expectations," said Minhajul. "There is no doubt regarding the talent but why they are not performing regularly is a matter of concern because we were expecting them to score heavily in the competition so that they could have taken some confidence under their belt before preparing for the upcoming international assignments," he said. BCB cricket operation chairman Akram Khan, who is also part of the selection process, recently said that they are taking some time before finalising the World Cup squad and would like to see two phases of DPL super league in an attempt to make them understand that they need to pull up their socks immediately. "Scoring runs is a habit and unless you are habituated, it is unlikely that you will perform consistently irrespective of the talent you possess. We are sure they will translate their potential on a regular basis because they have it in them for what it takes to shine at international level if we consider their previous performance against some major cricketing nations," he added. According to renowned coach Nazmul Abedin, who had seen them from their early days since they were enrolled in the BCB set-up through earning a place in the age-level competition, believes that they are paying the price for not developing a certain batting pattern. "It is true they did not develop any certain batting pattern," said Nazmul. "For a batman, it is necessary to develop a certain pattern as that would help him score consistently," he said. When you are following a certain batting pattern you know what you are trying to do and how you want to develop your innings. It might need to be changed to fulfill the team requirements but still you would do things by following certain principles," he said. "It is a mental thing [developing pattern] and I think that is one area they need to work on rather than following the present way as it will help them earn more success," he said. Nazmul added that their over aggressive or over defensive approach is largely due to the fact they are not following any certain batting routine that is a prerequisite to achieve success at international level. "It is true that someday they are batting very aggressively while at times they are coming up with an over defensive approach and due to this duality they are unable to follow a certain process," Nazmul added. "I am expecting them to do well in the World Cup because the ball will come onto the bat and all of them can play on their back foot and are competent at scoring runs square of the wicket," he said. Cricbuzz also accessed the preliminary squad that BCB has picked, which will further be pruned to a 15-member squad. BCB 20-member preliminary squad: Mashrafe Mortaza, Tamim Iqbal, Mahmudullah, Mushfiqur Rahim, Shakib Al Hasan, Soumya Sarkar, Liton Kumar Das, Sabbir Rahman, Mehedy Hasan Miraz, Mohammad Mithun, Rubel Hossain, Mustafizur Rahman, Mohammad Saifuddin, Shafiul Islam, Yasir Rabbi, Farhad Reza, Anamul Haque, Imrul Kayes, Mossadek Hossain, Taskin Ahmed.